Oz Is Excellent 3D on a home video makes it fun for kids and adults. The bold, dazzling and dramatic Oz the Great and Powerful comes to 3D Blu-ray with excellent quality. Nearly critic proof, the film brought one of the largest box office returns for 2013. However, although the film is a masterpiece of cinematography and CGI, the acting and direction do have problems. The film has also been released in a Blu-ray and DVD combo pack. The movie is a prequel to the original Wizard of Oz. In this story we find Oscar Diggs (James Franco) working in a side show as a magician with a traveling circus. A tornado comes while Diggs is escaping some very upset circus performers due to his misleading of young women and he jumps into his hot air balloon and gets blown away to a strange land. Here he meets the witch Theodora who mistakes him for Oz the expected ruler of the land. The two along with a monkey called Finley (voiced by Zach Braff) and a patched up porcelain doll called China Girl (voiced by Joey King) head for the Emerald City along the yellow brick road. They arrive at the city and are welcomed by two witches, Theodora's sister Evanora (Rachel Weisz) who currently rules over the city and Glenda (Michelle Williams) the good witch. During their introduction at the castle we see that both Theadora and Evanora are at odds with Glenda and their hospitality turns hostile toward her. Oz gets introduced to Evanora's assistants Master Tinker (Bill Cobbs) and Knuck (Tony Cox) who we find out later are not as friendly as they initially look. When Theodora and Evanora suspect that this man is not the great wizard they are expecting, Oz and Glenda get driven-off to Glenda's castle. So starts an adventure of power, ingenuity and magic. The special effects, computer graphics imaging and cinematography are exquisite. From the bubble transports to the flying witches everything looks as realistic as you would expect it to be in the enchanted land. The animation of China Girl is brilliant with her porcelain look, the charming doll moves and talks like she's human. The flying monkey Finley provides the friend that Oz needs to keep himself centered and on track. Very capable of helping Oz along with his ability to move about with wings, the furry friend gets him out of some tight situations. The depicted landscapes, forests, flowers and castle are very creative, vibrant and striking. The costumers make the population of Oz from munchkins to towns people an integral part of the strange place helping to generate a feel of fantasy. There's magical attention to detail of the sets and make-up, especially the witches who get transformed as the movie plays out. From gorgeous Glenda to the hideous sister witches, the crew does an amazing job. What's missing from this Oz comes early on in the movie, songs. At first I couldn't make out why there was no "Follow the Yellow Brick Road" ditty as Oz and the witch Theodora stroll down the famous walkway toward the Emerald City. Well I figured the filmmakers would wait a bit and then introduce the song, but never did. Hmm, I thought, they want to be original so soon we will get a new creative song from one of the characters in the film. To make a long story short, not even the monkey sings a song let alone good witch Glenda, or dare I say it, Oz himself. Some of the acting gets weak, especially that of James Franco who I feel is miscast, but most tots won't notice. Robert Downey Jr who was the first choice to play, bowed out after an incident involving a dead plant and Johnny Depp refused in lieu of his playing Tonto in The Lone Ranger. With the action pool slowly getting empty, Sam Raimi chose the kindly Franco to play the role of the ‘powerful' Oz. While his performance is not a complete bust, it lacks in force and appeal. The film has been rated PG by the MPAA for sequences of action and scary images, and brief mild language. Upping the fear factor to extend the audience may have been a mistake since the Wizard of Oz had a G rating with no offensive material. It did contain however, a very tame attack by flying monkeys, but had a normal witch face make-up on the actor. The two hour length of the should not bother on video even if it is over two hours as the youngsters can take a potty break with the touch of the pause button. "Before Your Very Eyes: From Kansas to Oz": This is a very good extra that takes you through the development of each of the lands of Oz. "Walt Disney and the Road to Oz": How Walt acquired the rights to Oz. "My Journey in Oz, by James Franco": Franco takes you on a documentary type look as his behind-the-scenes. "Metamorphosis": How they brought the Wicked Witch to life in a cool ten minutes of video. "China Girl and the Suspension of Disbelief" An excellent look at CGI and how they brought China Girl to life. "Mr. Elfman's Musical Concoctions": Danny Elfman who composed the musical score for the film is featured here. "Bloopers": The cast gets Looney with their outtakes. 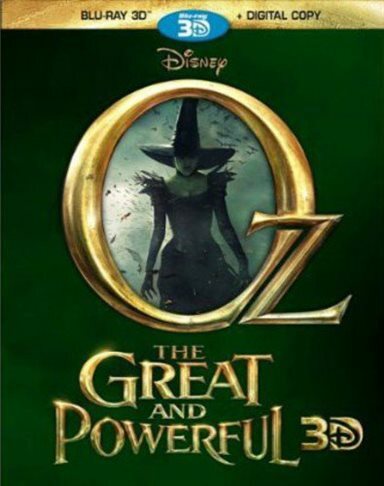 Download Oz the Great and Powerful 3D from the iTunes Store in Digial HD. For more information about Oz: The Great and Powerful visit the FlickDirect Movie Database.